From the Drum Corps International archives. The Colts perform at the 1990 DCI World Championship at Rich Stadium (now Ralph Wilson Stadium) in Orchard Park, N.Y.
1990 marked the first year in history that the DCI World Championships were held in the vicinity of Buffalo, N.Y. DCI twice returned to the home of the NFL's Buffalo Bills first in 1995 and again in 2001. Though the Colts would finish in 23rd place at the 1990 Championship, their performance would set the stage for strong competitive finishes in future years. The Iowa corps' ninth-place score at Rich Stadium in 1995 still stands as the highest finish in Colts history. The group's 12th-place finish in Buffalo in 2001, marked the seventh time in a period of 10 years that the corps earned a spot in the Finals. 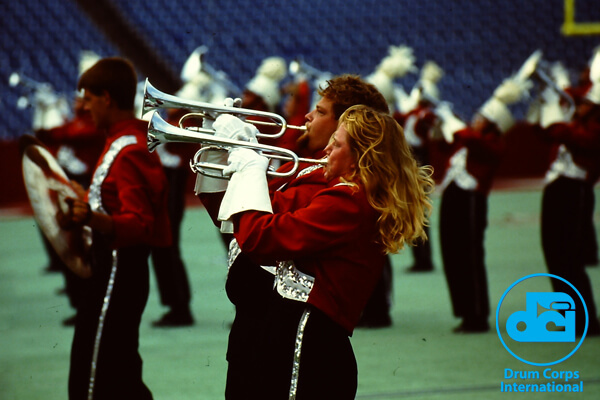 Scanning and archival services provided by Drum Corps International corporate partner WeScanFiles.com.